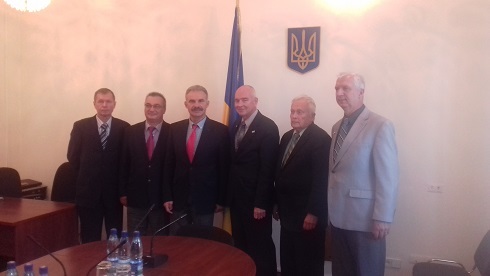 On July 10, 2018, the President of the All-Ukrainian Interconfessional Religious Christian-Military Brotherhood (hereinafter referred to as the Brotherhood) Sergiy P.Lysenko, Ph.D, retired colonel, and the Brotherhood’s international programs director retired colonel Ivan I. Kovalenko held a working meeting with the Chaplain General of the Canadian Armed Forces major-general Guy Chapdelaine and with Metropolitan Yurij (Kalistchuk), Archbishop of Winnipeg and the Central Eparchy, Metropolitan of Canada – Primate of the Ukrainian Orthodox Church of Canada Locum Tenens of the Eastern Eparchy (Constantinople Patriarchate), who arrived to Ukraine on a working visit. 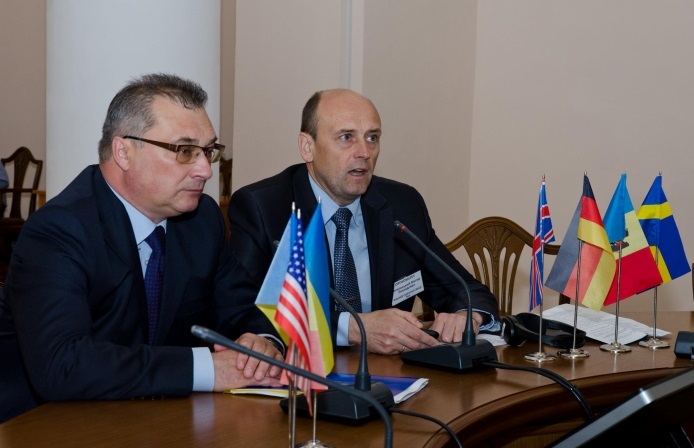 The meeting was held at the Department for Religious Affairs and Nationalities of the Ministry of Culture of Ukraine. Before the meeting the Canadian delegation was greeted by the Department's director Mr. Andriy V. Yurash. The meeting was attended by Mrs. Larisa D. Vladychenko - Deputy Director of the Department for Religious Affairs and Nationalities of the Ministry of Culture of Ukraine - Religious and Analytical Work Division chief, Ph.D. 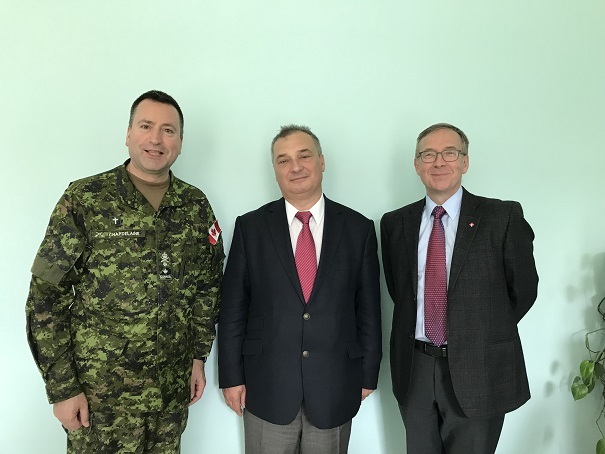 The Canadian part was also represented by Canadian Armed Forces captain Ken Butterworth, J4 Operations/Plans officer of the Joint Task Force – Ukraine, who was accompanying the distinguished guests. 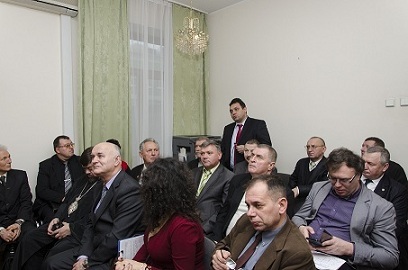 The participants of the meeting discussed the state of the Brotherhood and the directions of its further cooperation; the issue of inter-confessional cooperation in Ukraine in the sphere of military chaplaincy; the participation of non-governmental public and religious organizations in overcoming t he consequences of the war in eastern Ukraine, especially among the combatants and the civilian population of the front-line regions. Chaplain General of the Canadian Armed Forces major-general Guy Chapdelaine, paid much attention to the organization of the military chaplaincy service in Canada and received many qualified responses from the Department's experts regarding monitoring the process of the military clergy (chaplaincy) service institutionalization in Ukraine. Metropolitan Yurij Kalistchuk took an active part in the discussion. 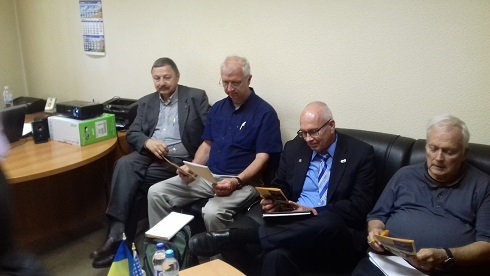 He was keenly interested in the results of the process of the military clergy (chaplaincy) service institutionalization in Ukraine and highly appreciated the role of the Brotherhood in it. 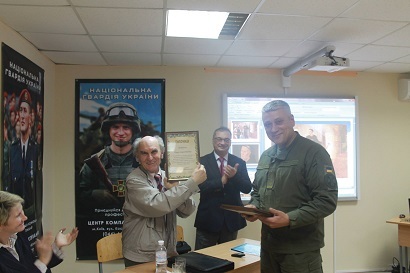 The President of the All-Ukrainian Interconfessional Religious Christian Military Brotherhood retired colonel Sergiy P.Lysenko handed in the Brotherhood's award, the order of the Saint Prince Vladimir of the First Class (“The Faith, State, Honor”) to General Guy Chapdelaine. 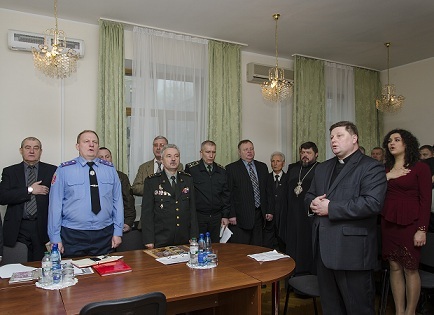 The meeting was held in an atmosphere of friendly communication and it contributed to an in-depth understanding of state-church partnership in the field of military chaplaincy and topical issues of inter-church dialogue and cooperation of religious organizations in modern Ukraine. 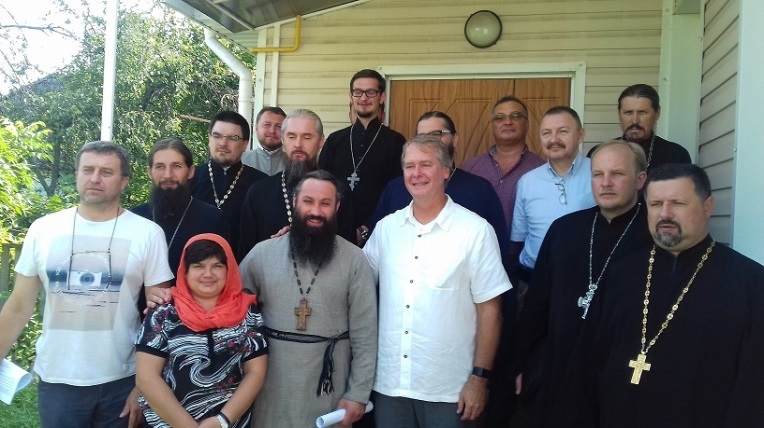 On July 3-4, 2018 a delegation of an American military-Christian organization, ACCTS (Association for Christian Conferences, Teaching and Service) visited Ukraine at the invitation of the All-Ukrainian Interconfessional Religious Christian-Military Brotherhood. The delegation was headed by ACCTS’ Executive Director Philip Exner (USMC retired colonel). 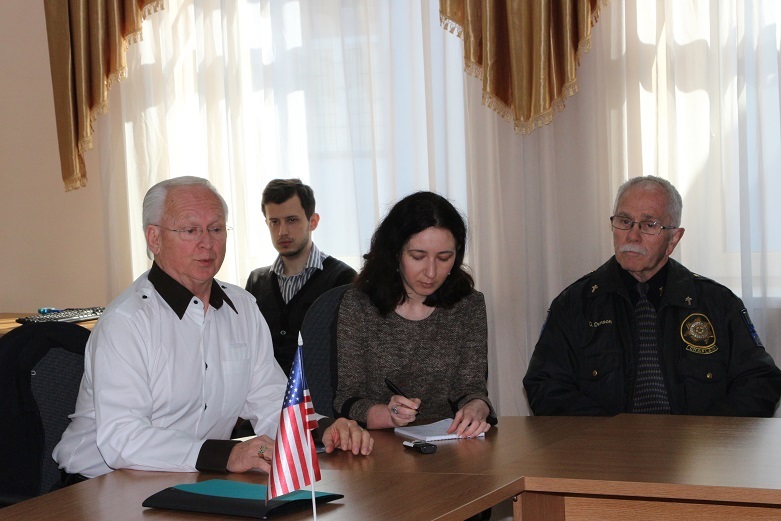 He was accompanied by Mr. Bernhard Kaltenbach, who is deputy director of ACCTS, as well as the Association’s Eastern European Coordinator Richard H. Barnes (USA retired lieutenant colonel). 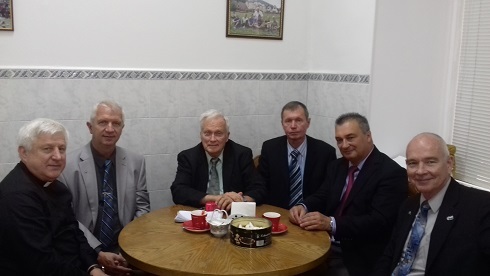 Thanks to the Brotherhood's mediation, the Delegation had meetings with People's Deputy of Ukraine Victor Yelensky, deputy chairman of the Parliamentary Committee on Culture and Spirituality, the head of its Subcommittee on State Policy in the area of freedom of conscience and religious organizations, and with Andriy Yurash, Director of the Department for Religious Affairs and Nationalities of the Ministry of Culture of Ukraine. 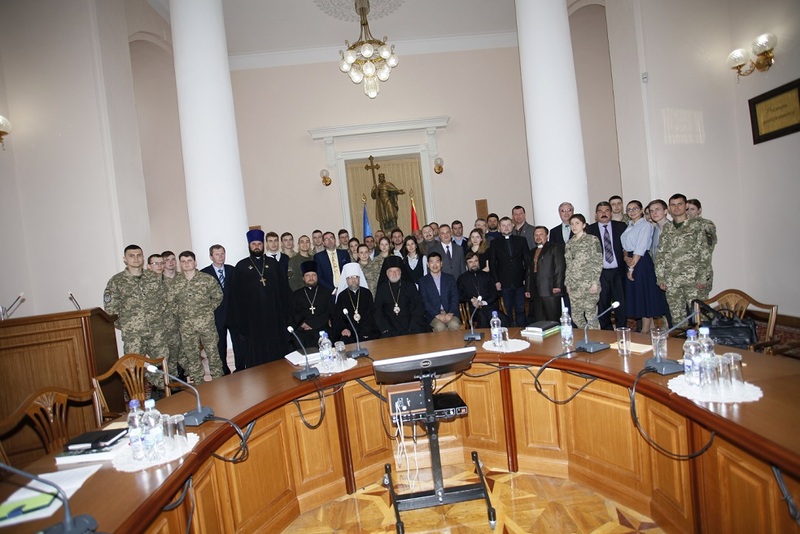 Together with the Brotherhood’s leadership, all three members of the delegation attended a round table discussion on the topic: "Monitoring the process of the military clergy (chaplaincy) service institutionalization in Ukraine during 2014-2018: results and outcomes". At the Brotherhood office the foreign delegation had the possibility to take part in a videoconference of the All-Ukrainian Interconfessional Religious Christian-Military Brotherhood’s leadership with the heads of regional offices and branches of the Brotherhood. 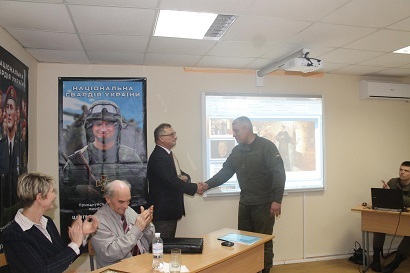 After the videoconference the delegation with great attention perceived a presentation on the Brotherhood's activities that was prepared by its president, retired colonel Sergiy P.Lysenko. 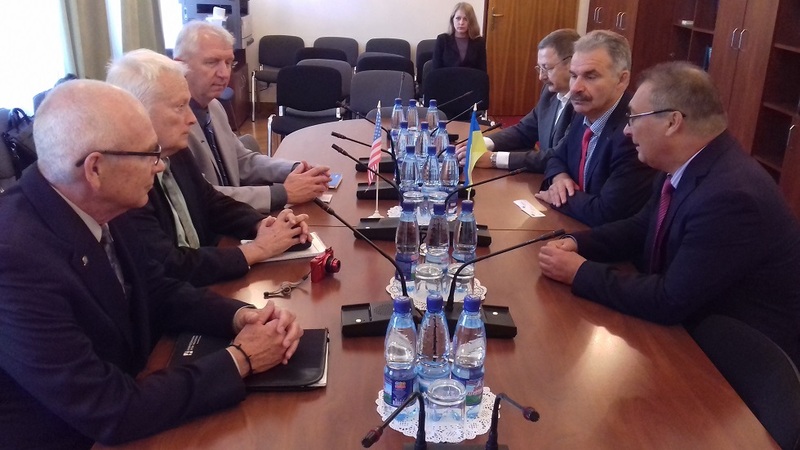 The American delegation's visit to Ukraine resulted in the decision to continue our cooperation in 2018 -2020. 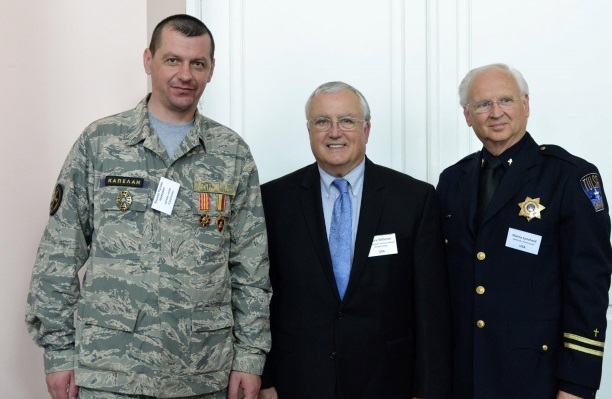 The president of the All-Ukrainian Interconfessional Religious Christian Military Brotherhood Sergiy P. Lysenko visited Canada at the invitation of the Military Christian Fellowship of Canada (MCF Canada). In Ottawa he had meeting with Chaplain General of the Canadian Armed Forces Major-General Guy Chapdelaine. 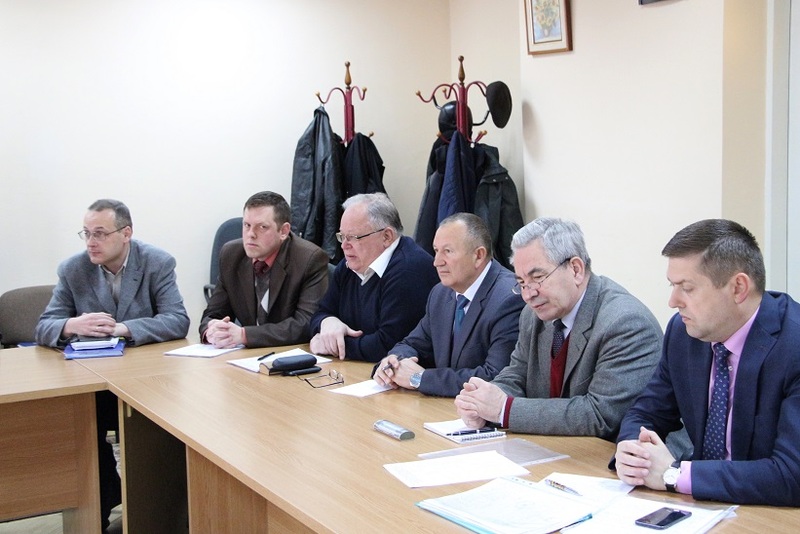 During the meeting, which was also attended by the president of MCF Canada, retired colonel Jerry Potter, the current issues of the formation of the military chaplaincy service in the Armed Forces and other military formations of Ukraine were discussed. The participants of the meeting also discussed the possible ways of interdenominational religious and public organizations' of both countries participation in psychological rehabilitation and social adaptation of veterans of antiterrorist operation in eastern Ukraine. 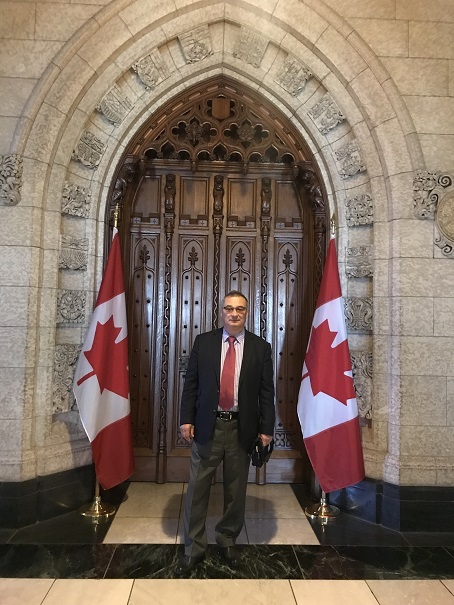 Sergiy P. Lysenko took a floor with a presentation to the members of the Christian Prayer group at the Parliament of Canada and to the parishioners of the Assumption of the Blessed Virgin Ukrainian Orthodox Cathedral in Ottawa, (in canonical unity with the Ecumenical Patriarchate). He also visited the Rehabilitation Center for former servicemen who received combat psychological and moral injury during service. THE EXPERIENCE OF THE POLICE CHAPLAINCY IN THE UNITED STATES. THE PRECONDITIONS AND PROSPECTS FOR ITS IMPLEMENTATION IN UKRAINE. 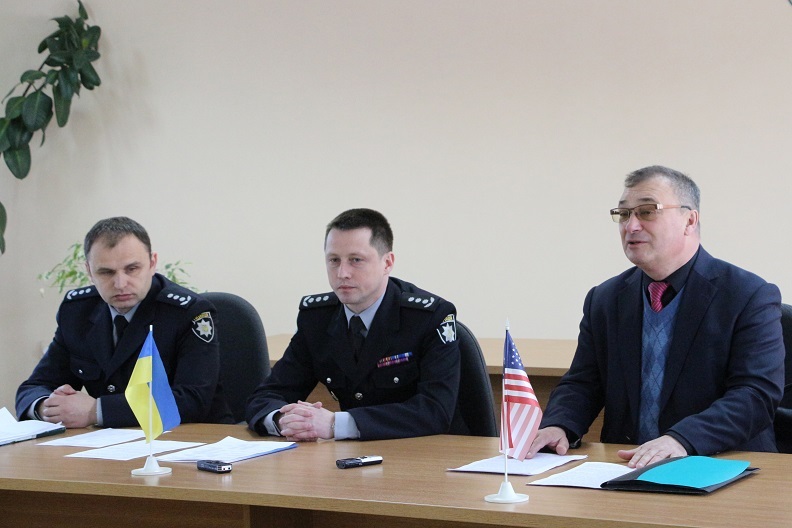 The involvement of not only scientists, but also the National Police of Ukraine territorial units’ representatives, including those working directly with the population, became a new stage in the study of the experience of the police chaplaincy in the United States, as well as of the possibility and feasibility of its implementation in Ukraine. 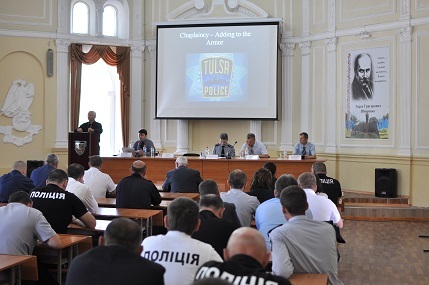 On May 21, 2018, several events with the participation of Denny Lynchard, the Executive Director of the Tulsa (Oklahoma, USA) Police and Fire Department Chaplaincy Corps, the Brotherhood’s representatives and officials of various subordinated to the Ministry of Internal Affairs of Ukraine structures were held in Kyiv. 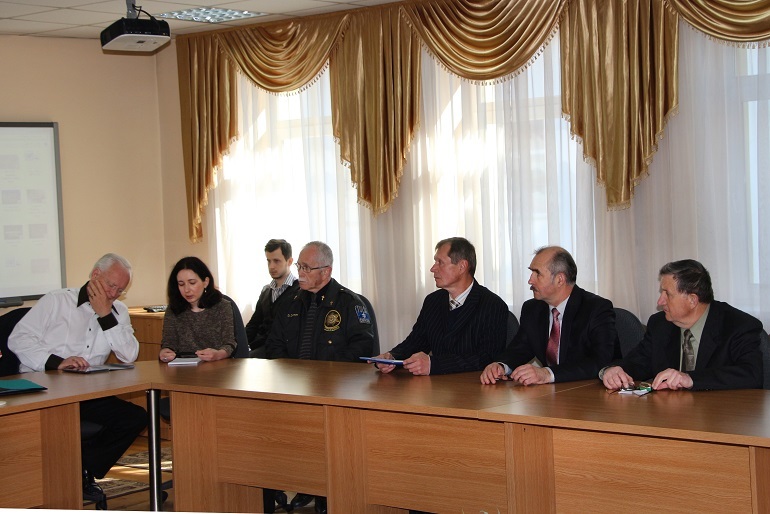 In particular, there were meetings with the officers and the employees of the divisions and departments of the Main Directorates of the National Police in Kyiv and Kyiv region, as well as visiting the Pushcha-Vodytsa Medical Rehabilitation Center. 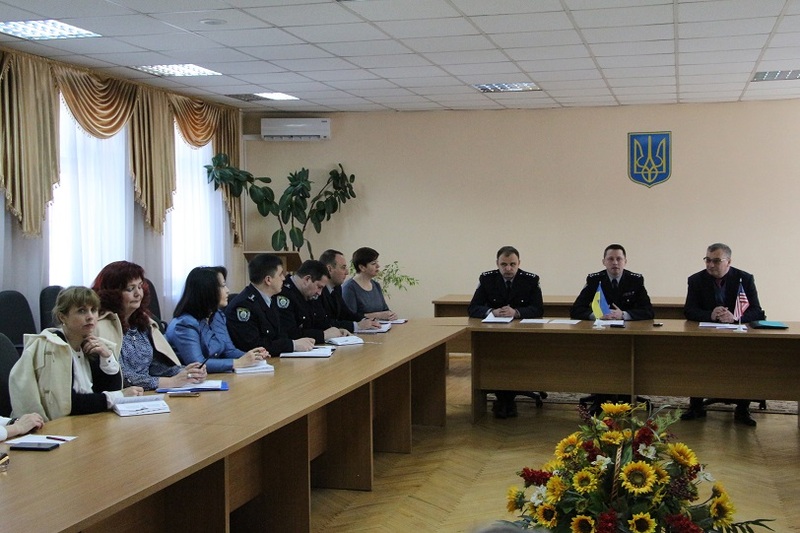 Similar meetings were held on May 23, 2018 in Odessa with the officers and the employees of the divisions and departments of the National Police Main Directorate in the Odessa region. 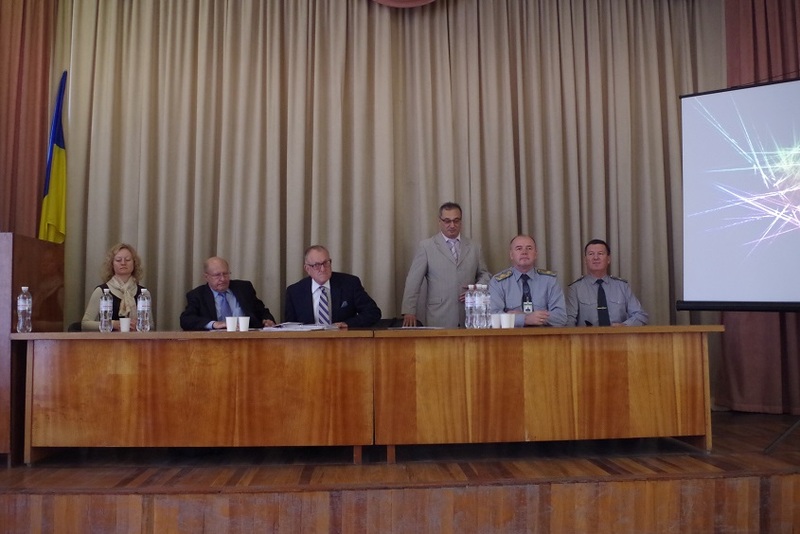 On May 22, 2018, at the Odessa State University of Internal Affairs there was a round table on the topic "The experience of police chaplains in the US. 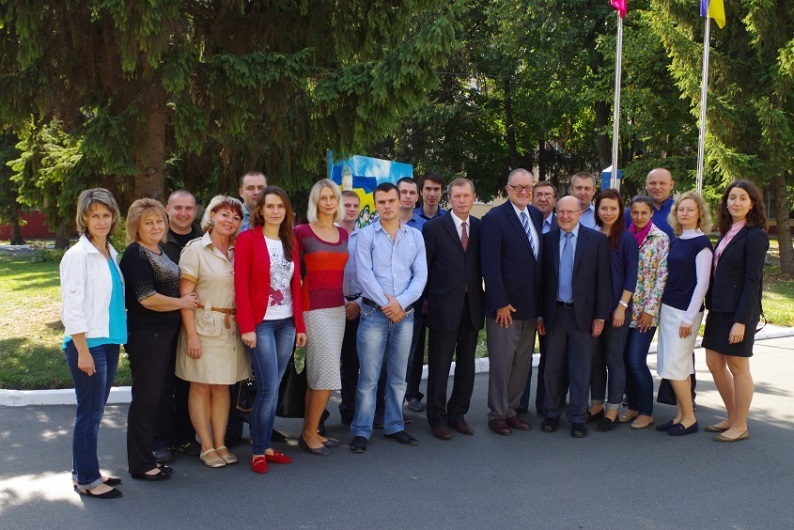 The preconditions and feasibility of establishing chaplaincy in the National Police of Ukraine." 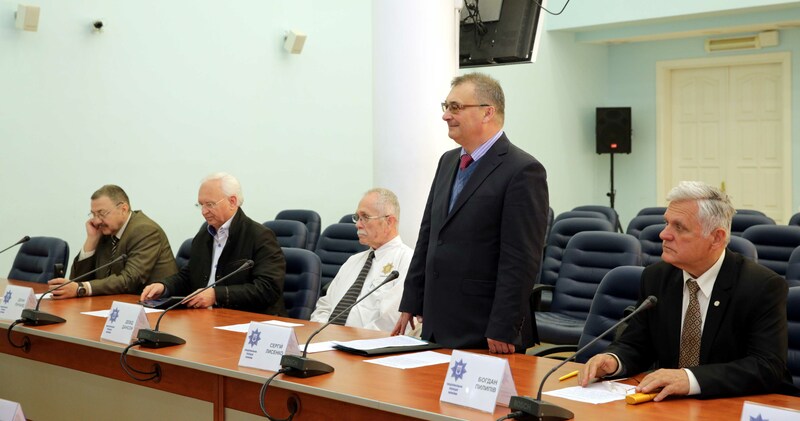 Among the participants of the event there were the university's scientists and researchers as well as the officials of the National Police Main Directorate in the Odessa region. The round table was moderated by the Brotherhood in conjunction with Danny Lynchard. 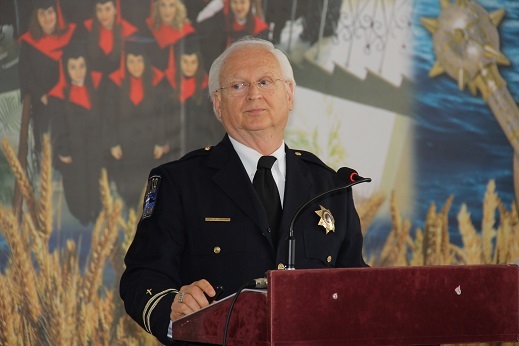 The same day the cadets of the University heard a review lecture on the organization of the police chaplaincy in the United States. The participants of the above-mentioned events will make a more in-depth analysis of the possibilities to take into account the experience of the police chaplaincy in the United States. It will be provided to their leaders in the form of concrete proposals and scientific articles. The Presidium of the Brotherhood expresses its sincere thanks to the leadership of the Ministry of Internal Affairs and the National Police, the Main Departments of the National Police in Kyiv, the Kyiv region, the Odessa region, the Odessa State University of Internal Affairs, as well as to all officials of the Ministry, the Police and the Educational Institution, who participated in the preparation and conduct of the aforementioned events. We are sure that the jointly done work will contribute to the growth of the image and authority of Ukrainian policemen in the society, and to the improvement of their relations with local communities, and to the spiritual enrichment of law enforcement. It was the topic of the international scientific and practical conference that was held on April 20, 2018 at Taras Shevchenko National University of Kyiv. 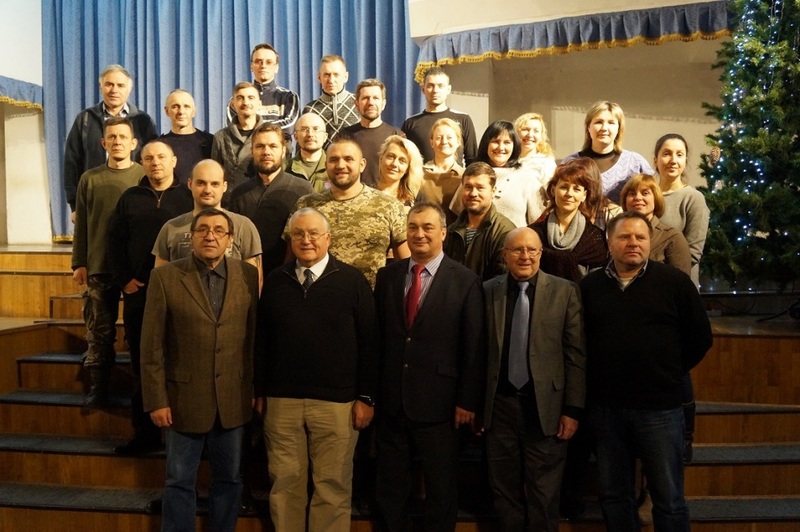 The conference was organized at the initiative of the All-Ukrainian Interconfessional Religious Christian Military Brotherhood with the participation and support of the Ministry of Culture of Ukraine, and the Faculties of History and Philosophy of Taras Shevchenko National University of Kyiv. Among the participants of the Conference there were scientists, researchers, professors and teachers of higher educational institutions, representatives of military and law-enforcement structures, priests of Ukrainian churches, as well as cadets of the Military Institute and students of the Historical and Philosophical Faculties of the Taras Shevchenko National University of Kyiv. Ivan Patrylyak – the dean of the Faculty of History of Taras Shevchenko National University of Kyiv, Doctor of Historical Sciences, Professor. One of the conference participants, a Canadian military chaplain, captain InSeob Won spoke about the organization and the activities of the chaplaincy service in Canadian Armed Forces. • Ukrainian Orthodox Church in the conditions of the Ukrainian Revolution of 1917 – 1918. • Military Pastoral Care during the Directory of the Ukrainian People's Republic. 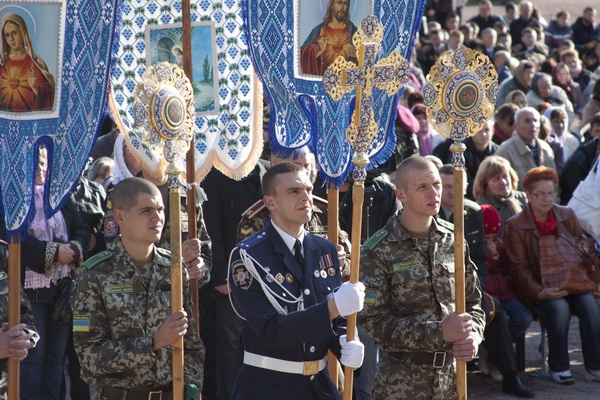 • The military chaplaincy in the Ukrainian Galician Army of the Western Ukrainian Republic. 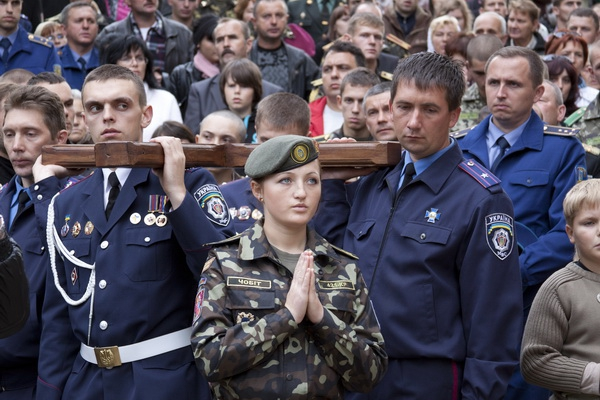 • The current state of military chaplaincy in the Armed Forces of Ukraine and in other military formations established according to current legislation. • Chaplain's service in the armed forces of NATO countries. As the results of the conference, the proposals of taking into account historical experience, chaplaincy experience in foreign countries, as well as of current developments of Ukrainian military priests in the interests of improving pastoral care among servicemen were worked out. The Organizing Committee expresses its sincere thanks to all those who participated in the preparation and holding the conference, as well as to the leadership of the Taras Shevchenko National University of Kyiv for their assistance and support. On December 15-16, 2017, the periodical final conference of the All-Ukrainian Interconfessional Religious Christian Military Brotherhood was held in Kyiv. The conference was also dedicated to the implementation of the program tasks and work directions for 2018 -2019. Representatives of the Brotherhood’s four regional offices, 20 regional branches and 9 district communities, representing more than 1000 members of the organization, participated in the conference. The delegates included the heads of the structural divisions of the Brotherhood, as well as representatives of its youth and women's sections. 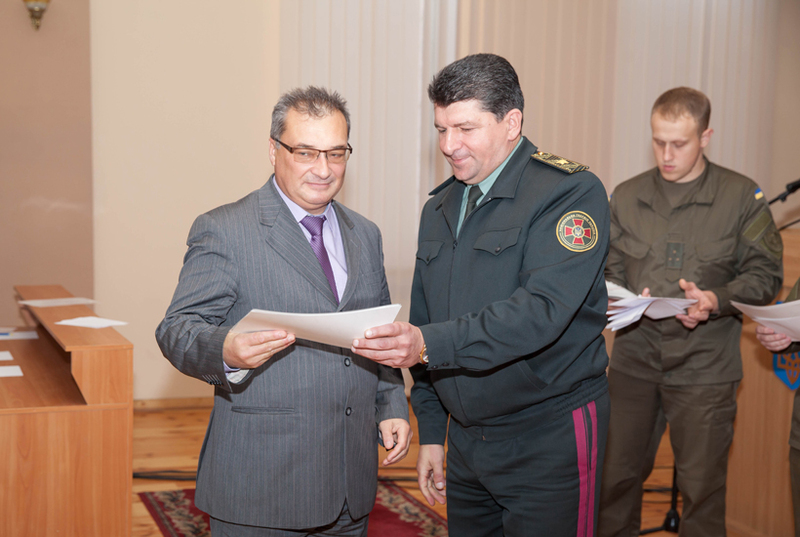 Sergiy LUBENETS - colonel, division chief at the Department of Military Education, Science, Social and Humanitarian Policy of the Ministry of Defense of Ukraine. Alexander IZDEBSKY - colonel, chief of the Service on Military Clergy (Chaplaincy Service) of the National Guard of Ukraine. Sergiy KUZMENKO - colonel of the reserve, Senior Inspector of the Division on Military Clergy. Ukrainian Orthodox Church of the Kyivan Patriarchate, Ukrainian Autocephalous Orthodox Church, Roman Catholic Church in Ukraine delegated their representatives to participate in the conference on behalf of the Churches. The summary report at the conference was presented by the President of the All-Ukrainian Interconfessional Religious Christian Military Brotherhood Sergiy LYSENKO, colonel (retired), Philosophy Doctor. The report's subject was "The results of the Brotherhood's activities on implementation of the program tasks and working directions adopted at the 6th National Conference of the Brotherhood on May 13, 2016. Prospects for improving the Brotherhood's activities in the light of the current situation in Ukraine." 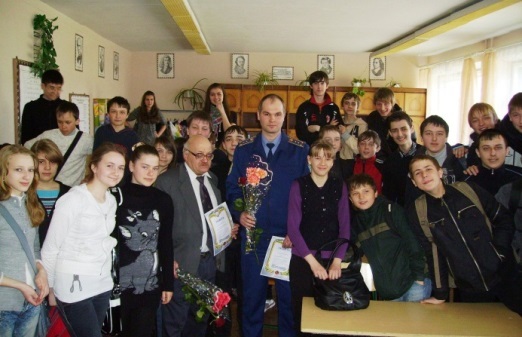 • The All-Ukrainian Social-Christian program "Spirituality. Clemency. Support." 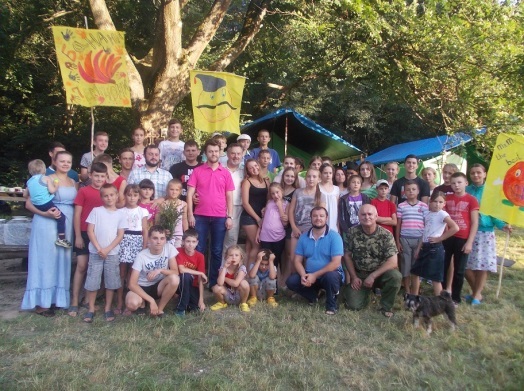 The Program is aimed at social and Christian support for victims of the Crimea annexation and of combat actions in Eastern Ukraine, namely, internally displaced persons, servicemen who have suffered as a result of hostilities and their families’ members, the disabled and veterans and other socially disadvantaged groups. • working actively with veterans, organizing social support and assistance. " We express our confidence that the conference will contribute to the improvement of the work of the Brotherhood's Presidium, of all regional offices, regional and district units of the Brotherhood, its organizational strengthening and growth. The conference devoted to the celebration of the 500th anniversary of Reformation in Ukraine was held at the Kyiv Faculty. 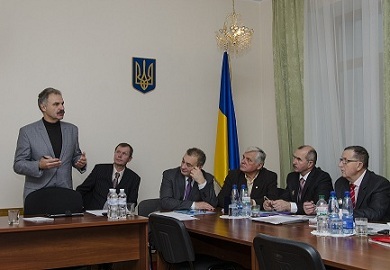 In accordance with the requirements of the Decree of the President of Ukraine and the decision of the Cabinet of Ministers of Ukraine to celebrate the 500th anniversary of the Reformation in our country, a round table discussion was held at the Kyiv Faculty of the National Academy of the National Guard of Ukraine. The topic was "Reformation and Protestantism: Impact on World Civilization and Ukrainian History" . The event was prepared and conducted on the initiative of the All-Ukrainian Religious Interconfessional Christian-military Brotherhood and by support of the ACCTS. The specialists from the Department of Religious Studies at the Institute of Philosophy of the National Academy of Sciences of Ukraine named after G. Skovoroda were invited to participate in the round table discussion: Doctor of Philosophy, Professor Petro Yarotskiy, Doctor of Philosophy, associate professor Vita Titarenko, president of the All-Ukrainian Confessional Religious Christian-Military Brotherhood Sergey Lysenko, Doctor of Philosophy, associate professor and veteran of the National Guard of Ukraine and vice-president of the brotherhood Volodymyr Glukhovsky. 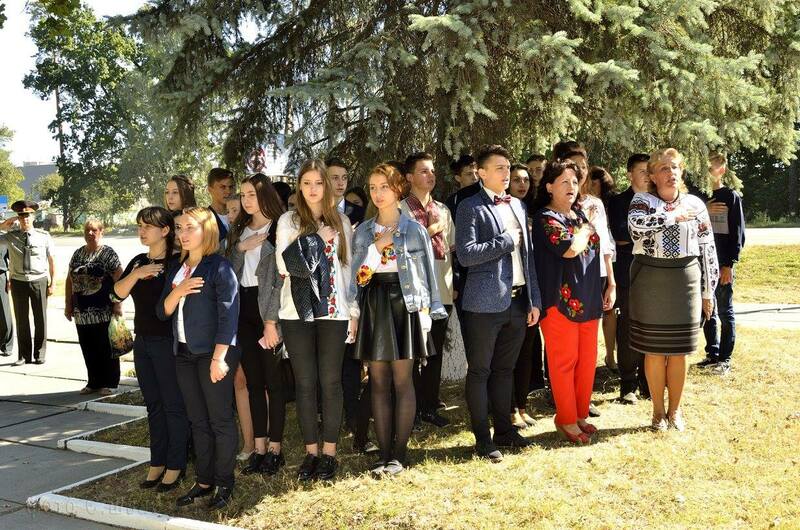 The purpose of the event was to facilitate the expansion of the general knowledge and outlook of the students, the ability to scientifically assess the religious processes that take place in Ukraine. The professor's staff and cadets of the Faculty took part in the round table discussion. 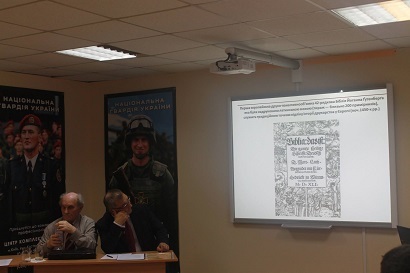 During the scientific discussion, the problems of the Reformation's influence on the religious, historical and socio-political life of the world and Ukraine in particular, development of military affairs and martial art in the 16th and 17th centuries were considered. 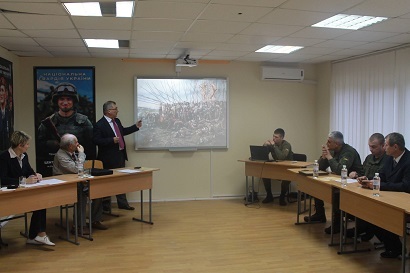 Each participant of the round table discussion got a new knowledge on the problems of religious studies, which he will need in further work with subordinates in the troops", - said the head of the faculty Colonel Dmitry Kornienko. Cognitive interest in the students caused information about the state of Protestantism in Ukraine, the role of Protestant churches and religious organizations in the socio-political life of our country. THE PRE-GRADUATE CADETS ON THE TOPIC OF LEADERSHIP'S PSYCHOLOGY. 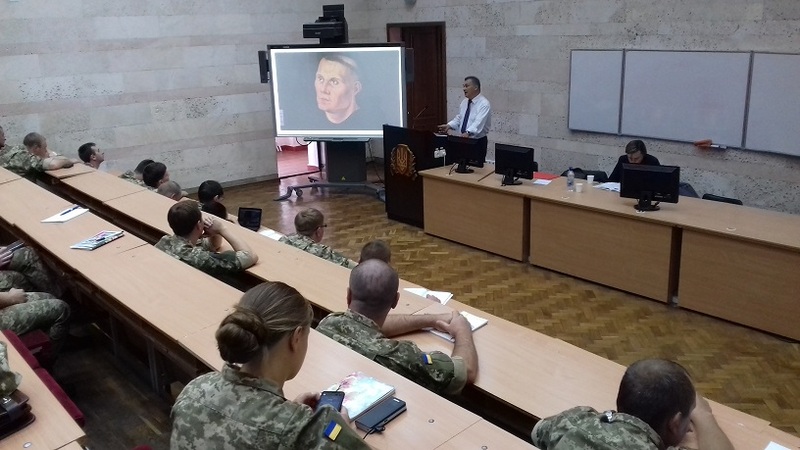 The All-Ukrainian Interconfessional Religious Christian Military Brotherhood prepared and during the first working week of July 2017 (from 3 to 7 July) held a five-day educational military-Christian conference with pre-graduate cadets of the Military Institute of Taras Shevchenko National University of Kyiv. The topic of the conference was "Psychology of Leadership: Courage, Competence, Honour." Almost 70 future officers, who will soon become commissioned, participated in the conference. 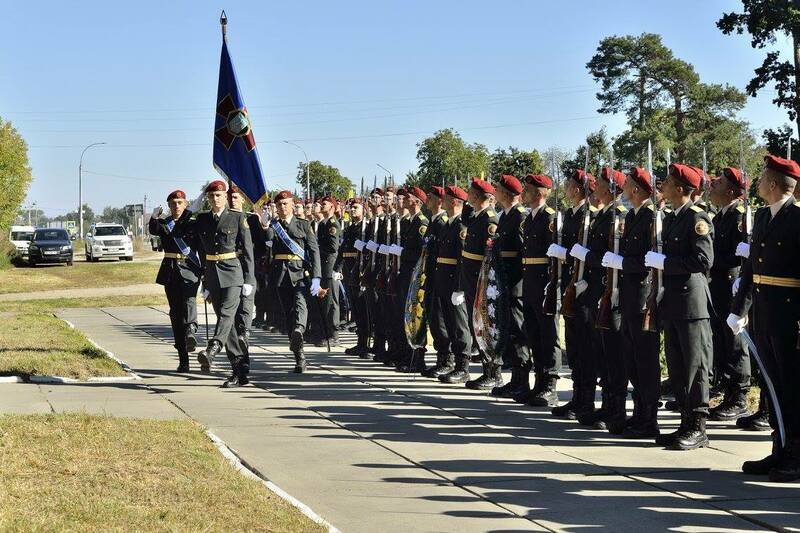 In the nearest future they will be promoted to the military ranks of lieutenants of the Armed Forces of Ukraine and arrive into the troops in an extremely difficult period of fighting in the East of Ukraine. 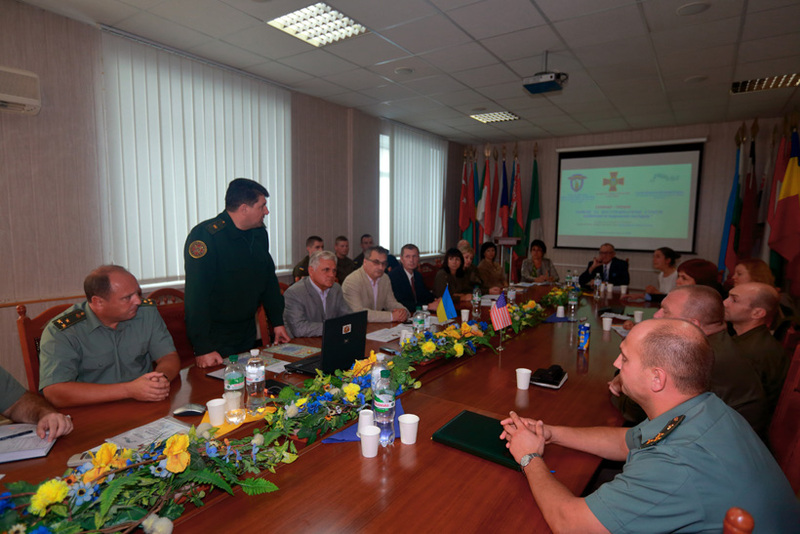 The event was held with the support of the Defense Ministry of Ukraine and the Ministry of Culture of Ukraine. Many professors, scientists and research staff from the Universities and research institutions of Ukraine took active part in the conference. The event was also attended by officers and generals, the members of the Brotherhood's Presidium. The conference's timing to the 500th anniversary of the Reformation had promoted to qualitative preparation and holding the event as well as enlightening its religious constituent. It gave the possibility to show the Reformation and Protestantism as a prominent historical factor influencing European history, culture and military affairs, including Ukrainian ones and to demonstrate the practical significance of the Bible and the Christian doctrine for military activities. Taking into account the diversity of religious organizations in Ukraine, one can say today’s religious situation in the country is rather complicated. And the multi-confession factor affects many processes in military structures. The introduction of military chaplaincy in the Armed Forces of Ukraine and in other military formations makes this problem more actual. And it is the graduates, the young officers, as the primary governing section, which relies on the knowledge of the history of religion, biblical foundations, the ability to work with people, it is them who have to be leaders and the authority in service and in everyday life, and have to lead subordinates and comrades-in-service. A pre-graduate cadet who participated in the event said, "Five days had flown as one day. However, on completion the conference I can firmly point out that during these days I found a lot of new things that are necessary for my further work in the troops. First of all it is about the practical skills of working in extreme conditions with subordinates. The new for me was the knowledge on certain events in the history of religion and in particular its influence on social life both in historical past and in modern conditions. Now I differently perceive the meaning of the Bible. For the first time, I could personally communicate with the priests of different denominations. And most importantly, I realized that in order to be a leader in a team, one need to constantly work to improve his knowledge, communication skills and to be spiritually educated person." The conference began with the speeches of the Brotherhood’s President Sergiy Lysenko, the leaders of the Military Institute and officers who participated in combat operations in the East of Ukraine. 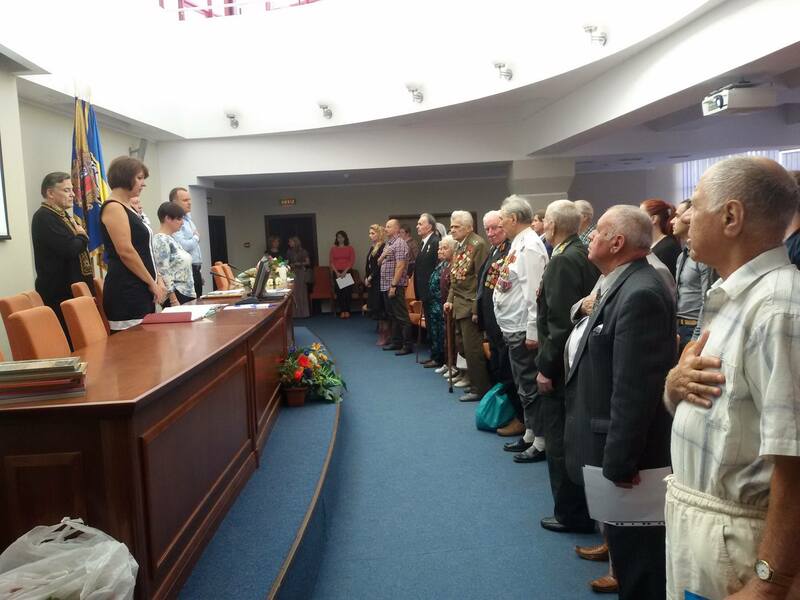 The participants of the conference commemorated the soldiers and officers who were killed in the anti-terrorist operation by a minute of silence. • the issues of establishing contacts and service communications. The second day also was devoted to the problems of combat stress' overcoming, to working out the methods of psychological help and to practical actions in the context of hostilities. 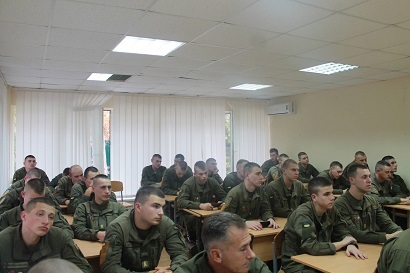 Each cadet was trained and received methodological materials on educational topics. "The Religious situation in the modern world and in Ukraine"
"The Reformation and Protestantism and their influence on world history, art and military affairs"
"The Reformation and evolution of military art during the 30-year war (1618 - 1648)"
"Protestantism in Ukraine and in the world." A broad discussion on the Bible's role in the world culture was held at the conference. Also the basics of Christian leadership and the behavior of an officer were highlighted. 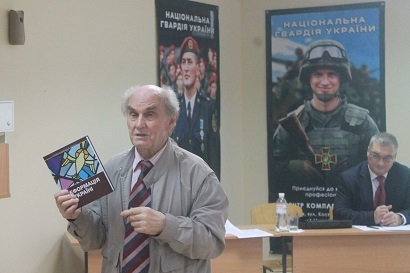 The fourth day of the conference was devoted to the discussion of problems of military ethics, the theory of "just war" and the development of international humanitarian law under the influence of ideas of Christian humanism, as well as the history of Ukrainian military formations in the First and Second World Wars. During the discussion the issues of the modern hybrid war were highlighted in practical context. The main attention was paid to the ethics of modern warfare, to the correlation of the principles of the "just war" theory and practical methods of conducting modern military conflicts. The last day of the conference began at the National Sanctuary Complex "Sophia of Kiev". The cadets got acquainted with the monuments of history and architecture. 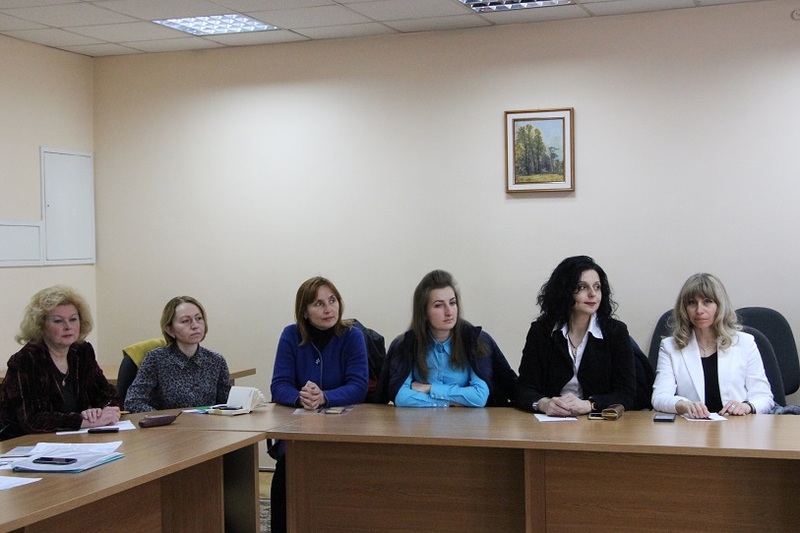 They also listened to the lecture on "The spiritual foundations of Ukrainian national culture". 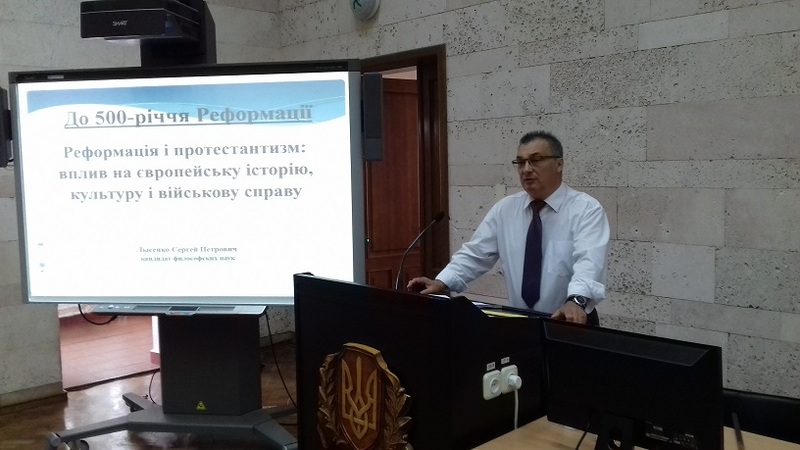 Then the lecture on "Biblical Foundations of Christian Leadership" was presented by Valentin Korenevich, who is the President of “Olive Branch Ukraine” and director of chaplain program in Kiev Theological Seminary of Evangelical Christian Baptists Church, Bachelor of Theology. 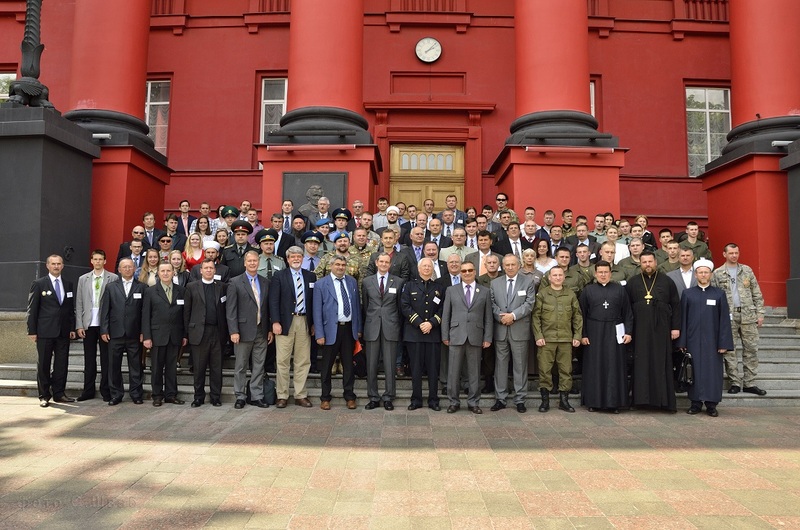 The conference ended in St. Michael's Golden-Domed Monastery, where the cadets listened to the lectures on the history of Orthodoxy in Ukraine and modern issues of the introduction of military chaplaincy in the Armed Forces of Ukraine. The participants of the conference listened to the teachers of the Kyiv Orthodox Theological Academy of the Ukrainian Orthodox Church of Kyiv Patriarchate. The event ended with the presentation of diplomas and honorary diplomas to the active participants of the conference. 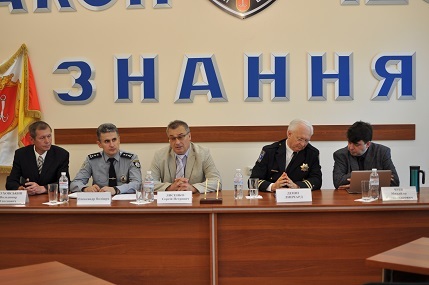 Police chaplaincy: International Experience and feasibility of its implementation in Ukraine. On April 19, 2017 at the Ministry of Interior of Ukraine a working meeting of the leadership of the All-Ukrainian Interconfessional Religious Christian Military Brotherhood and the officials of National Police of Ukraine, responsible for dealing with personnel, was held. 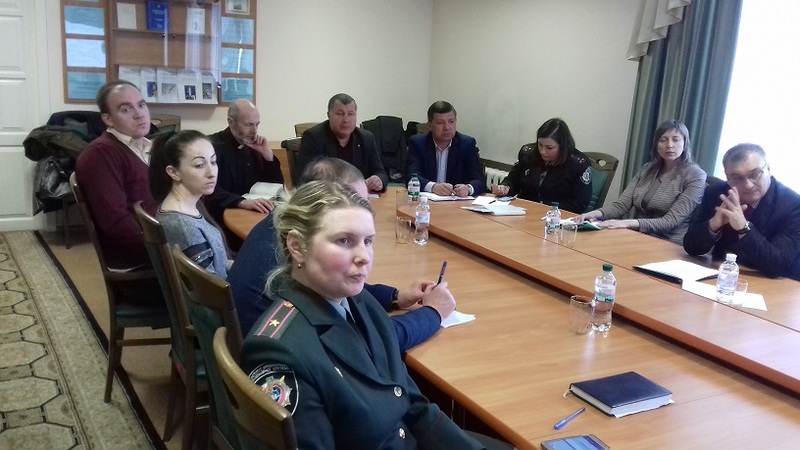 The topic of the meeting was to discuss possible areas of cooperation and to learn foreign experience of police chaplaincy, as well as the opportunities of using it in the interests of further Ukrainian National Police reform. There were two foreign guests of the Brotherhood at the meeting to share their personal experience. 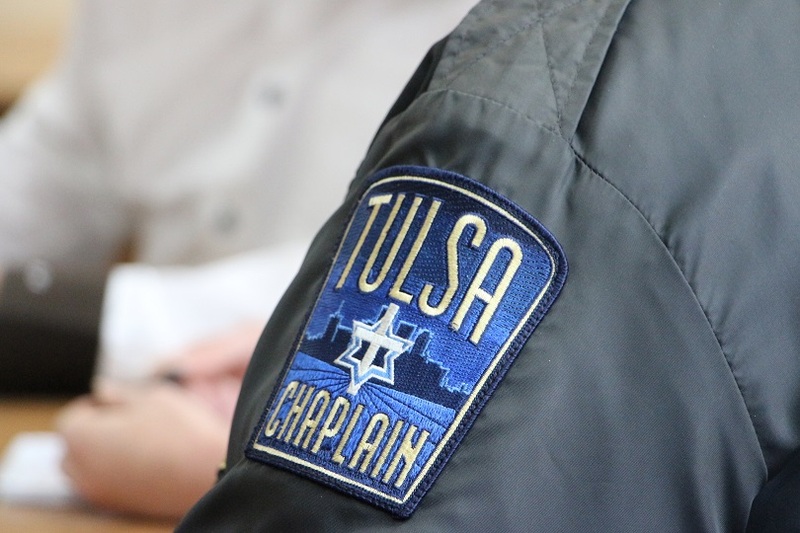 They were the US police chaplains, namely Danny Lynchard - Executive Director of the Tulsa (Oklahoma, USA) Police and Fire Department Chaplaincy Corps and David Danson - Head of Chaplaincy Service Sector of Tulsa city Police Department (Oklahoma, USA). 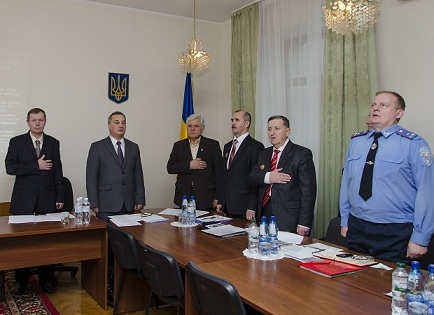 The results of the meeting were reported by the officials of the National Police of Ukraine to their leadership. 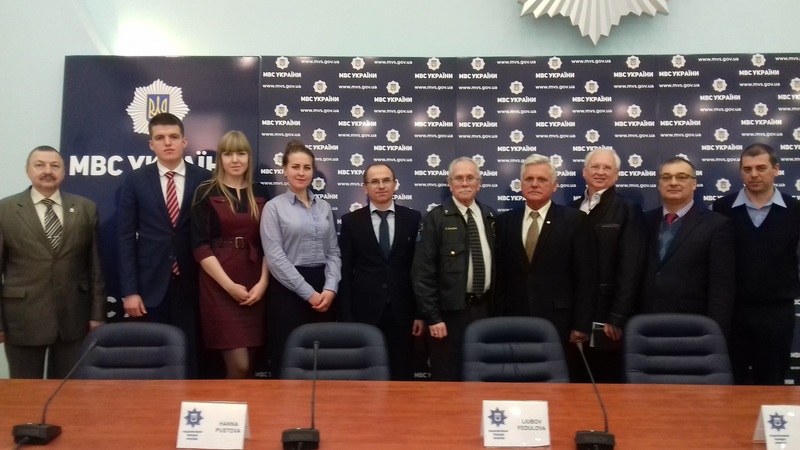 The same day, on April 19 at the National Academy of Internal Affairs and on April 21 in Lviv State University of Internal Affairs there were round tables on the topic "The experience of police chaplains in the US. 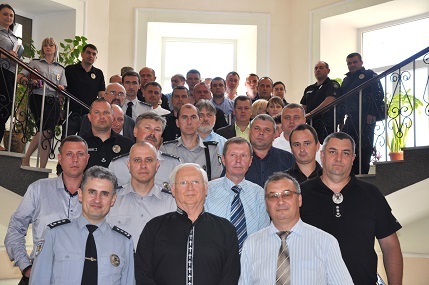 The preconditions and feasibility of establishing chaplaincy in the National Police of Ukraine." • representatives of the All-Ukrainian Interconfessional Religious Christian Military Brotherhood. 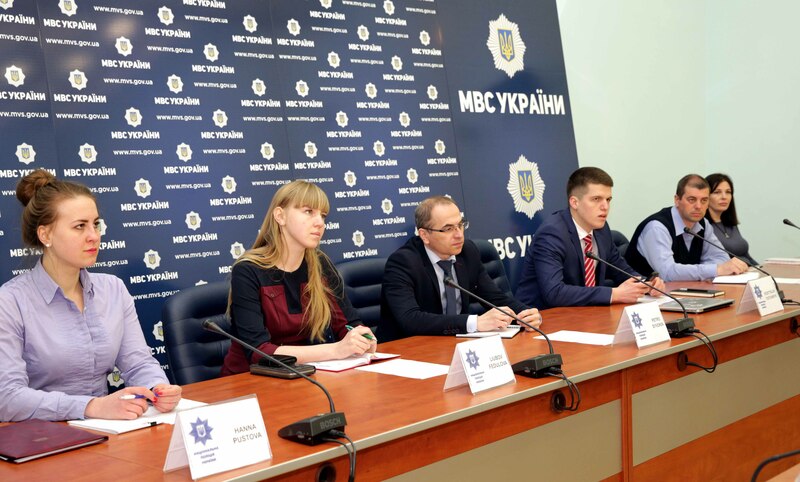 The rector of Lviv State University of Internal Affairs police colonel Roman Blahuta emphasized on the feasibility and benefits of such events. 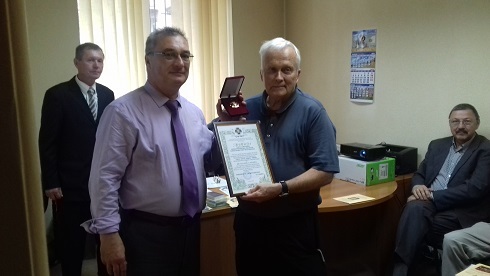 He said: "The Institute of chaplaincy in Ukraine is not a novelty for us, but chaplaincy in law enforcement is actually that what is practised by a number of countries in the world, including the United States. And today we have the possibility to hear, to discuss, to ask questions and to express our position on the topic. 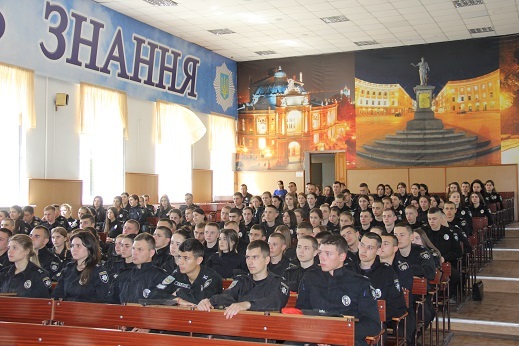 And it is obviously very good that the question of chaplaincy is raised up not only in practical police units, but also on the territory of Lviv State University of Internal Affairs. It really is so because our educational installation is precisely the place where the identity of a future policeman is formed. The experience of American colleagues shows that chaplains' attraction to the law enforcement activities does significantly raise the level of population’s trust to police as well as promotes the implementation of police functions." 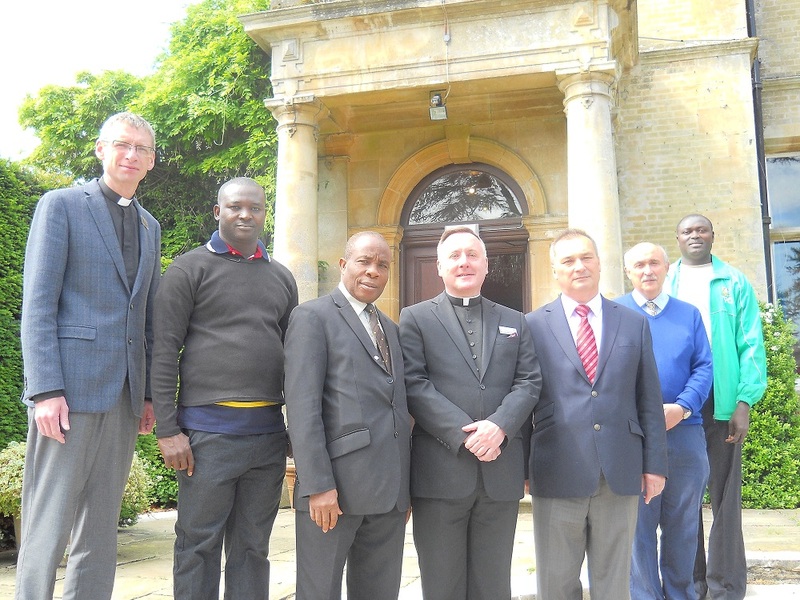 During the roundtables, chaplains David Danson and Danny Lynchard presented the experience of spiritual support to police staff in emergency situations, such as terrorist attacks, confrontation of police and protesters, the death of loved ones etc. 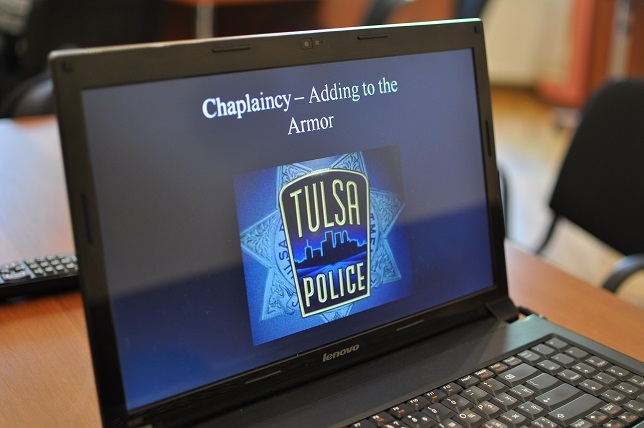 They talked about the basic principles of organization of Oklahoma police chaplains’ activities with personnel, with the persons who violated the law and with the public. Much attention was paid to the role of a chaplain and to pastoral care in extreme situations such as death, serious illness, riot, the use of weapons or other special means, suicide of a perpetrator or a colleague. The chaplains shared their experiences in preventing emotional “burnout” of staff when they constantly work with such composite categories of people as criminals are. They also spoke of privacy and personal data protection in the chaplains’ activities. The president of the All-Ukrainian Interconfessional Religious Christian Military Brotherhood Sergiy Lysenko talked about the role played by the Brotherhood in this project. 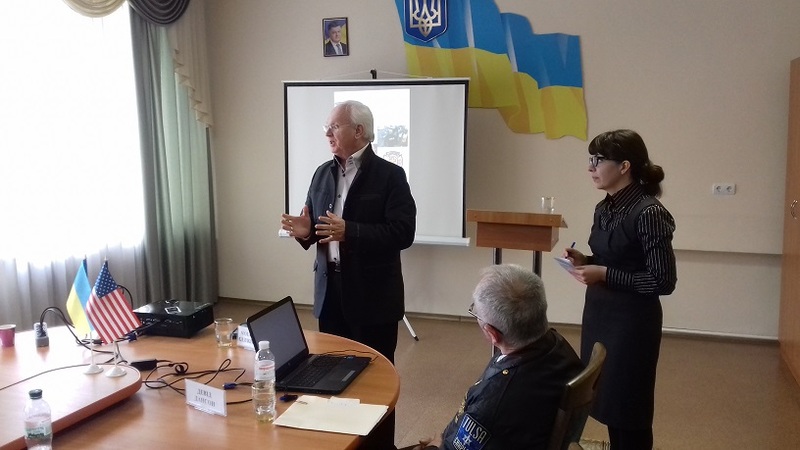 He underlined the importance of bringing the foreign states’ police chaplains’ experience to Ukraine and feasibility of implementing chaplaincy in Ukrainian National Police.
" Even at the beginning of our Brotherhood’s activities we did really understand that a church’s entry into that or another structure is a certain process. And of course it must be careful, scientific, balanced and professional. We fought for this for a long time, and the anti-terrorist operation contributed to the fact that nevertheless it is being realized. Police chaplaincy at present is in the area of our current research interests. For a long time we were not oriented towards it because we understood that the content of personnel activities in law enforcement and military units differs. 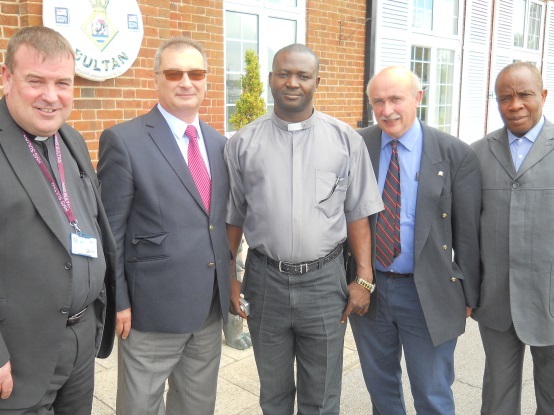 However, due to our familiarity with foreign partners, now we are confident that the police chaplaincy is no less interesting process that has been rather successful in other countries," – he said. 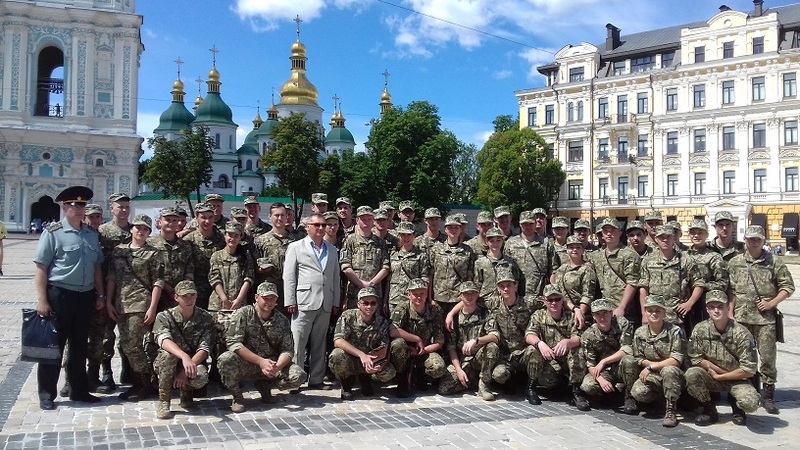 On the eve of the great Christian feast of the Annunciation the All-Ukrainian Interconfessional Religious Christian Military Brotherhood arranged a charity event in the Central Polyclinic of the Interior Ministry of Ukraine. 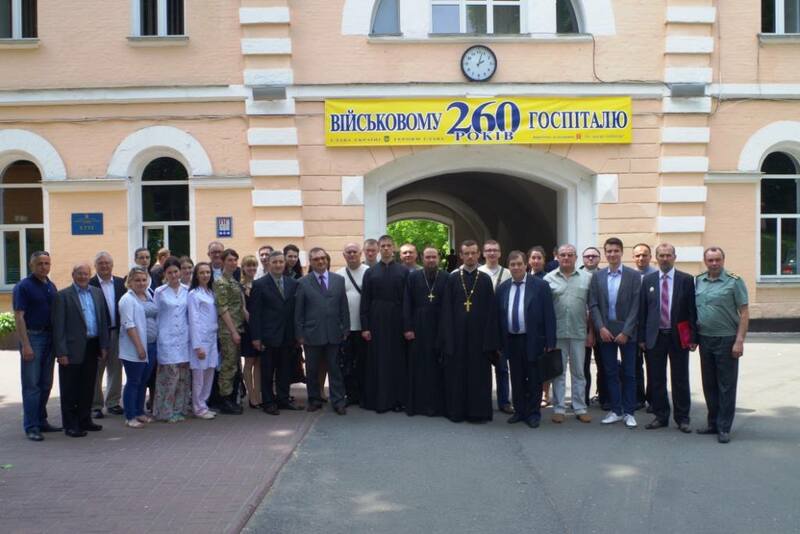 The charity was provided as a part of the Brotherhood’s All-Ukrainian Christian Program named "Spirituality. Mercy. Support." 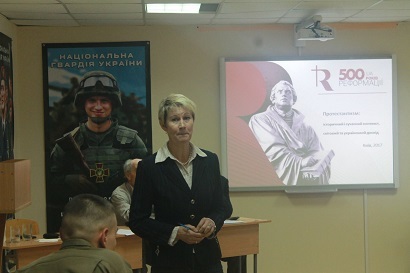 The program is aimed at social and Christian support for the victims of the Crimea annexation and of fighting in the eastern part of Ukraine, namely at IDPs, soldiers and police officers who suffered during combat actions and their families, at the disabled and veterans of military service and the interior service, as well as at National police veterans. This particular charity event was aimed at the needs of the polyclinic's patients, at providing them with high quality medical care, supporting the medical staff with needed supplies such as syringes, bandages, utensils for blood transfusion, thermometers, medical gloves, etc., necessary for first aid. The above mentioned collected supplies were transferred to the head of the Central Polyclinic of the Interior Ministry of Ukraine. 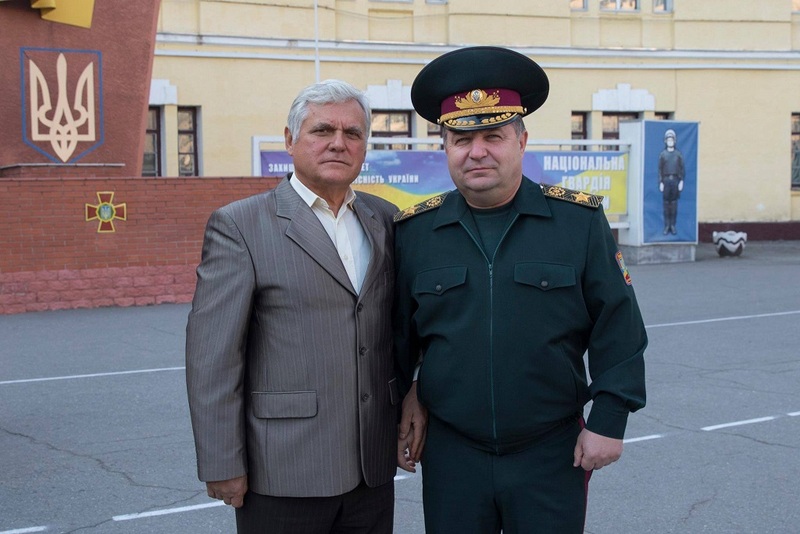 On behalf of the Brotherhood – the Brotherhood’s President Sergiy Lysenko and Vice President Volodymyr Gluhovskyi. The Brotherhood expresses sincere gratitude to all who participated in preparing and carrying out the action, namely, to all regional offices of the Brotherhood and to our foreign partners from "Olive Branch International" as well as to the leadership of the Interior Ministry, that promoted its implementation of the charity event. was established by the decision of the Third International Military Christian Conference in Ukraine. The Launching Conference of the Brotherhood was held on December 15, 2000 in Kyiv. The State Committee of Ukraine on Religious Affairs registered the Brotherhood as All-Ukrainian Interconfessional Religious organization by the decision of the Committee’s College on June 2, 2001. • The Interconfessional Christian religious organization which is established under the Law of Ukraine "On freedom of conscience and religious organizations" on the initiative of the top five leading Ukrainian churches. It united Christian believers, including military and law enforcement agencies’ representatives, mainly those belonging to the reserve or retired officers, as well as civilians and clergy who wish to work in its cells. 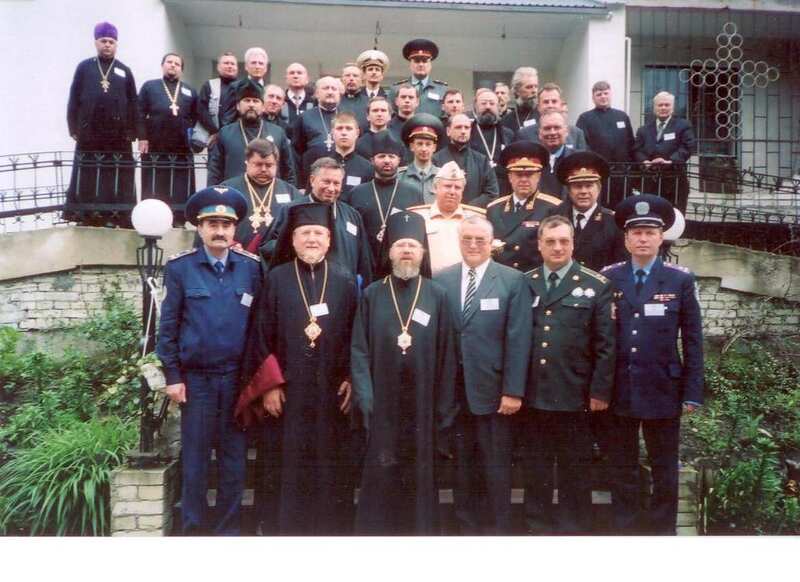 • The basis of the Brotherhood is formed by generals and officers who retired from the Armed Forces of Ukraine and law enforcement agencies, representatives of various Christian confessions. They lead the regional offices, regional branches and district communities that characterize the aforementioned Brotherhood cells activities as parts of a highly organized and disciplined military and religious structure, with great capacity and experience in a professional, methodical and organizing work with people. • The Struc ture of the Brotherhood is based on the principles of individual membership and consists of district communities, regional branches and regional offices. 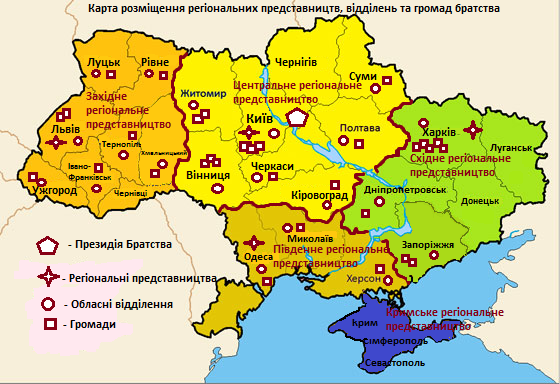 It covers up to 83.3% regions of Ukraine, the city of Kyiv and a number of district centers. facilitating to high-quality implementation of activities and programs planned on the Brotherhood national conferences, as well as implementation of the Brotherhood Presidium decisions . • The youth and women's section of the Brotherhood were created at regional and district communities. These sections are directly involved in dealing with youth and servicemen families. • The Brotherhood arranged cooperation with representatives of the churches belonging to the All-Ukrainian Council of Churches and Religious Organizations in all regions of Ukraine. • We are represented in Public Councils of military and law enforc ement agencies and regional state administrations. 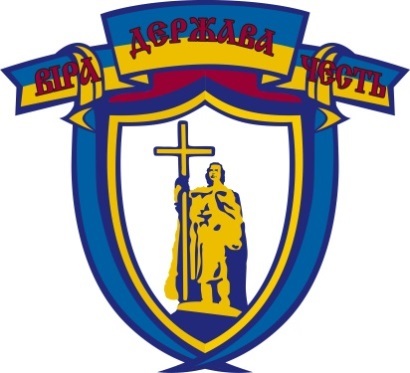 • The Brotherhood established close ties and cooperation with the leadership of the military and law enforcement agencies, active military and law enforcement servicemen and members of their families, including anti-terrorist operation (ATO) participants, state and local governments, veterans and public organizations. - Olive Branch International Inc.
* the Brotherhood is a member of the Association of Military Christian Fellowshops (AMCF) since 2015. THE BROTHERHOOD PROGRAM FOR THE YEARS OF 2017 - 2021. • All-Ukrainian Social-Christian program "Spirituality. Clemency. Support.". The Program is aimed at social and Christian support for victims of the Crimea annexation and of combat actions in Eastern Ukraine, namely, internally displaced persons, servicemen who have suffered as a result of hostilities and their families’ members, the disabled and veterans and other socially disadvantaged groups. 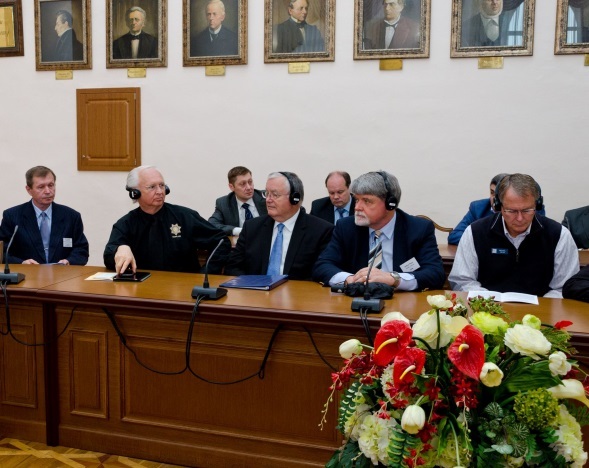 • The Brotherhood arranged and conducted in Ukraine 6 international scientific military-Christian conferences, more than 30 round tables and seminars with the involvement of leading foreign experts, 18 international seminars for Ukrainian churches priests. • representatives of the Brotherhood took part in the international military-Christian conferences abroad (USA, Canada, UK, Austria, Germany, Poland, Bulgaria, Croatia). • social protection of servicemen and law enforcement officers.